Villa Market is a local chain of western-style grocery stores, the first such chain in Krungthep. 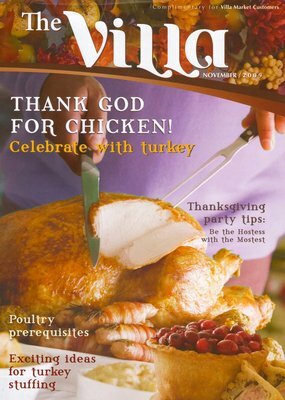 They produce a monthly magazine for customers which this month featured the incongruous headline “Thank God for Chicken! Celebrate with turkey”, leading to much head-scratching on my part. Yesterday was my thirty-ninth birthday. An Australian friend, Jason, shares my birthday (although nine years younger) so he and his partner along with our mutual friends came over for dinner. I’ll have those pictures for you in a few days. A lot of people get worked up about birthdays. For some reason, I don’t. I enjoy getting older and think life continues to get more interesting as each year goes by. Perhaps more pragmatically, I don’t see the point in fretting over something that is inevitable. That would be like ruing the tides. I’ve also been away from Thai lessons for two weeks because the World Film Festival of Bangkok has occupied some of my free time. 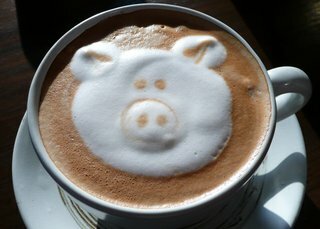 Which means I’ve been missing my latte art! 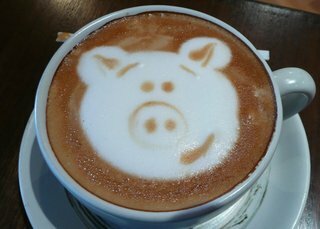 Left: the original pig latte that I received. Right: the same latte with some embellishments by me. Bitter Brown cafe also does cocoa art. Here is a bear. A mouse? A rat? I’m not sure what it is meant to be, actually. This entry was posted in Uncategorized and tagged art, Latte Art, Thanksgiving, Turkey by christao408. Bookmark the permalink. Glad to see you back again Chris. I know every one has misssed you. I loved your art with the latte foam. 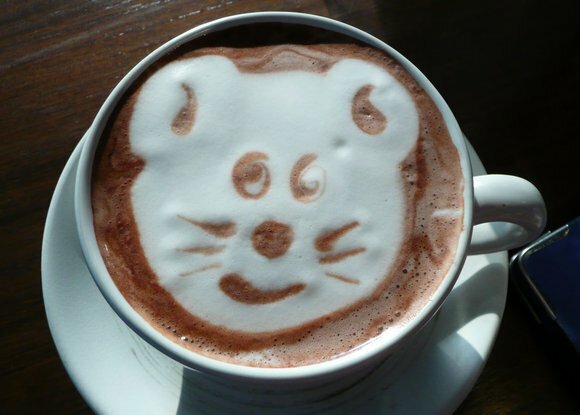 I dont know how I would feel if an animal was staring at me from a latte.My father spoke Thai at one time in his life, it is one of the countries he has lived in doing social work for the Red Cross or Red Crescent. The last one looks like a bear! Welcome back from your border run! When I saw that poster, my reaction would be.”Mai-ben-rai.” The Thais have their own way of saying Happy Thanksgiving! Yeah I’m not into my own bday celebration either. @yang1815 – Oddly, I had several birthdays as a child that I decided to forgo celebrating. Didn’t seem like there was much of a need for the fuss. one last thing–thanks for reminding me about Robbie William’s new album! I have to check it out!! @christao408 – Well growing up my family didn’t make a big deal out of them so I’m just used to not having celebration I guess. We would just go out and eat and maybe a present at the most. Happy belated birthday, Chris! BTW, your embellished pig is much better than the original. You should be an artista-barista. The latte art is so good! I think it’s a bear.Btw, Happy birthday again. Happy Birthday! I don’t celebrate my own birthday either, but rather make birthday cakes for my friends. Happy birthday! I don’t know that you are so young. Happy belated birthday! The piggy was cute. I think your creation is more of a mouse. Mmmm Bitter Brown! Definitely a favorite coffee shop.Happy Birthday again Chris and many, many more to you! Happy birthday…..still so young….and so talented too! I’m going to Starbucks afterwhile to collect used coffee grounds for my garden, and I will see if they have a latte artist. Daughter’s Starbucks holds “Trivia” team contests every week end by the way. Happy Birthday :)I’m a few years younger than you are; but we’re close enough in age. I know what you mean; as the years go by birthdays mean less and less to me — not that they meant much to me in the first place. For me, it’s more of not feeling much reason to celebrate. I mean, yes I was born. I guess in a way it’s just another occasion or excuse to have a special event or dinner.Perhaps the magazine is saying Thank God for chicken as in Chicken is Holy and from God, Turkey is not, therefore eat Turkey? Haha.Those workers are artists. I’m amazed. First off, happy belated birthday!I’m blown away by the latte art. Amazing! I’m not sure I’d want to drink the latte if it were that pretty. @Jillycarmel – @TheCheshireGrins – @marc11864 – @TheLatinObserver – @choyshinglin – @beautyandthebum – @jassmine -Thank you for the birthday wishes. @chow@ireallylikefood – Chickenness is next to godliness? =D@Gma_Joyce – Coffee related trivia or general trivia? @Redlegsix – A book of Tinglish would be fun to read. Add that to my list of books to write, including “Overloaded Trucks of Thailand”. @Rm2046 – I’m trying to figure out what exactly it is you would be drawing in the latte foam. =? @Dezinerdreams – I recall my teacher saying it was a bear but I never knew bears had such long whiskers. @dynamiqvision – More of a final quality control person, I think… much as the chef is there to expedite the work of the cooks, adding granishes and wiping the rim of the plates. @lil_squirrel4ever – As much as I thought it was going to be a waste of money, the espresso machine we bought has been one of the most enjoyed and certainly the most used appliance in our house. @lil_squirrel4ever – You’re welcome. Why isn’t he bigger in the US? @CurryPuffy – Yes, their way of saying Happy Thanksgiving is, “More food!”@Paul_Partisan – Oh, very exciting. What other countries did he work in? I’m glad to hear he made an effort to learn the language, which always makes the time in a foreign country more interesting. @ZSA_MD – Thank you. Nice to be back. Awww Grrr. Sorry Chris I totally missed your birthday. I hope you had a great day and will have a beautiful year.